The Fusion Air Sound System is an option with any H2X model. This system includes four interior water resistant speakers and a subwoofer to maximize the sound quality. The Fusion Air Sound System connects quickly and easily through the Bluetooth of your phone or other device allowing you to stream your favorite station or playlist. 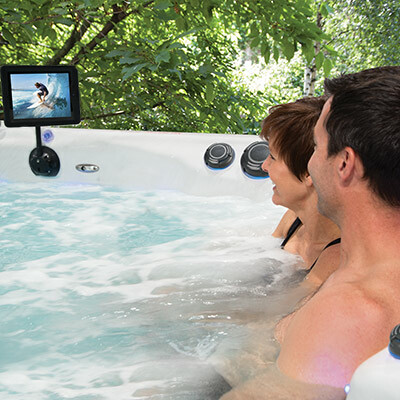 You can even connect your iPad® while using a waterproof case and mount, and stream your favorite movie or show...turning your swim spa into a "cinematic" experience. Music can help elevate your mood and reduce stress?